What you won’t hear on the news!! Matt Tribulski places a young osprey back in its nest. Beach nesting birds and New Jerseyans who live along the coast both depend on a resilient shoreline — and plenty of sand. This season, thanks to a grant from the National Fish and Wildlife Foundation (through their Hurricane Sandy Coastal Resiliency Grants Program), a team led by New Jersey Audubon worked with Conserve Wildlife Foundation of New Jersey, The Wetlands Institute, New Jersey Division of Environmental Protection, and the US Fish and Wildlife Service to make the beach community of Stone Harbor Point more resilient for birds and people alike. 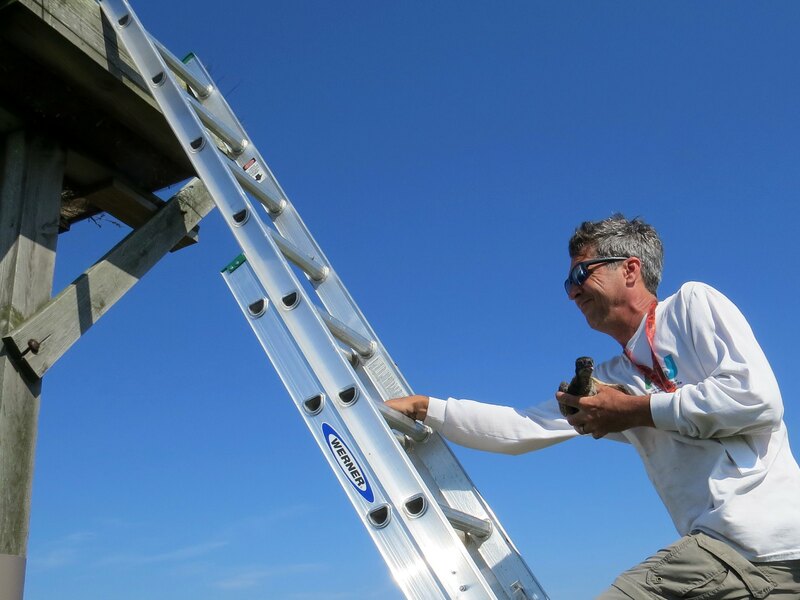 Conserve Wildlife Foundation of New Jersey collaborated with New Jersey Audubon to improve beach habitat for Piping Plovers (endangered in New Jersey), American Oystercatchers and the colonially nesting Least Terns and Black Skimmers. Sand from the southernmost tip of the point was moved to create three areas of higher elevation. The new landscape is expected to benefit Red Knots, Semipalmated Sandpipers, Sanderlings, Semipalmated Plovers, Black-bellied Plovers and others. Stone Harbor, a small beach town along the New Jersey shoreline will see added coastal resiliency benefits and flood protection due to this innovative project that combined the needs for shorebirds with the needs for shore residents. The Stone Harbor project also included the construction of a wide berm of sand near the beachfront parking lot at the far south end of the town. This aspect of the projects aims to increase flood protection for the residents on the developed area of the island. The National Fish and Wildlife Foundation (NFWF) is a non-profit organization created by Congress to preserve and restore our nation’s native wildlife species and habitats. NFWF is one of the largest funders of wildlife conservation in the world. They fund science-based projects and community-driven solutions. A Green Eggs and Sand Curriculum Workshop will be held May 29-31 at the Wetlands Institute in Stone Harbor, Cape May County, New Jersey. The workshop will delve into the ecological connections between horseshoe crabs and shorebirds, human connections to horseshoe crabs, and the challenges encountered in managing this resource via presentations, field trips and hands-on activities. The Sedge Island Natural Resource Education Center offers week long experiences in the heart of Barnegat Bay. Sedge Island Fishing Experience: June 25 to 28, 2015 open to students entering grades 8 and 9 in the fall of 2015. Application deadline is March 31. Sedge Island Field Experience: July 28 to 31, 2015 open to students entering grades 7, 8, and 9 in the fall of 2015. Application deadline is March 20. Sedge Island Field and Research Experience: July 8 to 14, 2015 for students entering grades 10 and 11 in the fall of 2015. Application deadline is April 17. For more information, visit Conserve Wildlife Foundation’s website. An American kestrel. Photo courtesy of Jim Gilbert. The Species on the Edge 2.0 Multimedia Contest combines high school students’ expertise with technology and their love for nature. Students show why New Jersey’s wildlife is important by creating a video, app, podcast, webpage, or other multimedia project. But best of all, its FREE and offers all New Jersey high school students the opportunity to win scholarship money! Special thanks to Species on the Edge 2.0 Multimedia Contest sponsor PSE&G. All entries are due before April 30, 2015. For more information and to learn how to enter the contest visit our website. Contact Stephanie Feigin at stephanie.feigin@conservewildlifenj.org. Derek Noah, CWF Intern Summer 2014, collecting patron surveys at Stone Harbor, New Jersey. My name is Derek Noah, I was an intern this summer for Conserve Wildlife Foundation of New Jersey (CWF). I am a wildlife and nature enthusiast who likes to kayak, bike, and hike . I live in Monmouth County and I go to the beach during any extra time I have. The Northern diamondback terrapin is a small to medium-sized species of turtle that lives in coastal salt marshes, including the marsh near the Stone Harbor Boulevard Causeway. Adult terrapins are commonly struck by vehicles while attempting to cross causeways, and terrapin eggs are eaten by raccoon and other mammalian predators. Currently, CWF’s Wildlife Biologist, Stephanie Egger, is working with other researchers and organizations on the best way to protect wildlife and satisfy people’s needs that visit, live, or work in coastal communities in New Jersey. I collected information from visitors, residents, and employees of Stone Harbor about their understanding and perception of terrapins and management of terrapins along roadways through a patron survey. I worked on this project in July and August and surveyed nearly 500 patrons! I conducted the surveys on the beach as well as local stores and shops. The survey introduced general questions of terrapins and ideas on how to limit terrapin road death through different road management practices. The patron survey can be viewed here. 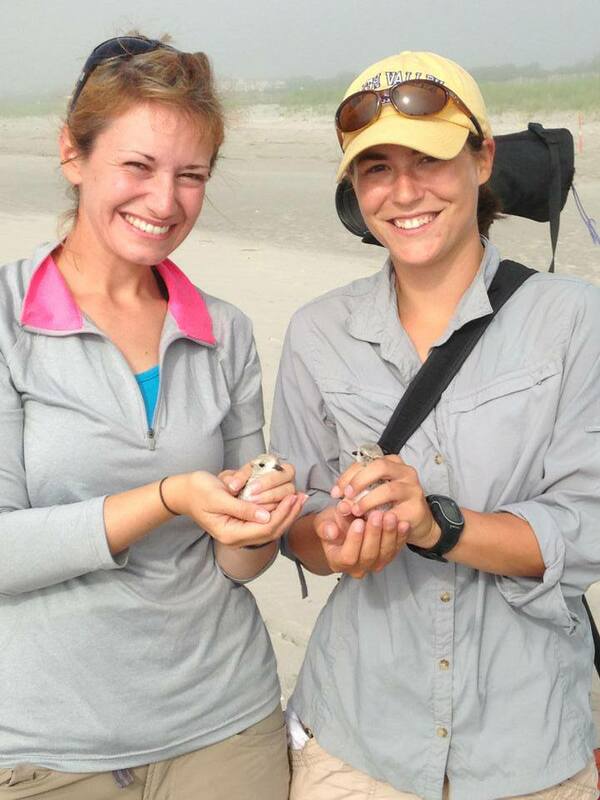 Emily Heiser (l) and Lauren Gingerella (r) with piping plovers in hand for banding.